Why can’t we talk to potential customers as if we were sitting across the table from them? I believe we can. I believe we have to. Instead, brands look at their audiences as a set of statistics rather than a one-to-one conversation. And it’s little wonder why they often wind up sounding like they’re talking to a set of statistics. Why? Because there’s a fear that your brand might not sound professional? First of all, if you don’t make it conversational enough, there’s just as much risk that your brand might sound professional and completely non-captivating. Secondly, you can be professional and relate to the audience at the same time. It’s not impossible. Third, conversational doesn’t necessarily mean so loose that it’s off brand in some instances. It’s time to err on the side of talking like a human and sounding less like an ad. 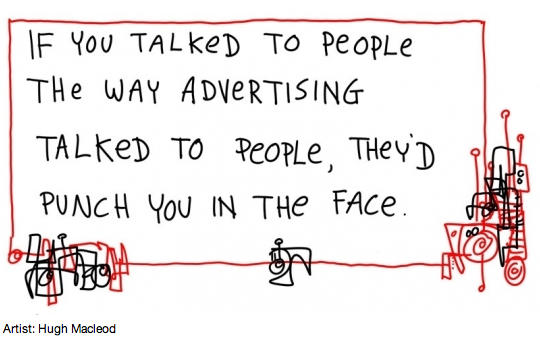 There’s nothing wrong with ads. Just ones that are dead-ends for making meaningful connections with their ice-cold tone.